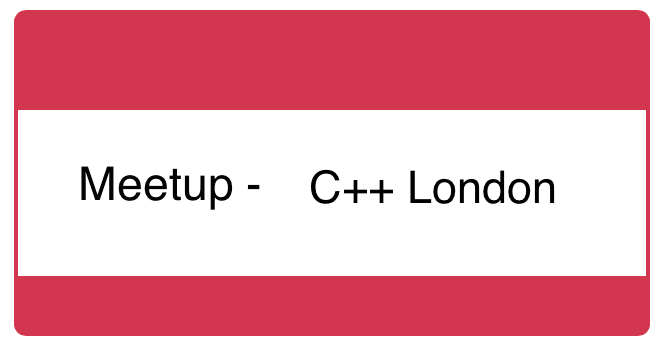 This is the first time that the Stockholm C++ and the London C++ group have combined to produce a series of lightning talks, half given from Sweden and half from England. Raised issues with generators and lexers when trying to do this, particularly for debugging. What about std::variant? Has knowledge of the type that it’s holding, and there’s std::visit that can overload function call operators for each type. // visitor class is defined elsewhere, too far from its declaration! The template overload makes clever use of deriving from a lambda via templates and C++17 features. The details are here. Bjarne also referenced: Matt Kline’s post on std::visit is everything wrong with modern c++. How to make it easy to write state machines? Hierarchy, entry/exit action, queuing, no heap allocations, no code generation. Mikael’s framework provides a finite state machine base class from which you derive and post events as they arrive. Each state derives from a framework state base class, and provides an event method to transition into other states. Compile time lookup-table – with a very convincing demo in compiler explorer, where marking the lookup result as constexpr changed the compiled code to simply a constant. Paul Dreik – what is this std::forward thing? Thoughts are to introduce varid, a keyword based on the position of the declaration of the variables. Evaluated at compile time, a bit like address-of, possibly the hash of the file name, row and column of the referenced variable. The use is for faster automatic differentiation. When writing Catch 1.0, Phil wrote Clara 0.x – a command line parser library (but it never reached maturity). As part of Catch 2.0, he has written and completed Clara 1.0! The latest version of the library introduces class Opt which declares command line options, which are then combined with the pipe operator. For mathematical functions in various domains. z = f(x,y) e.g. hypotenuse as root of sum of squares in a triangle. But what about values of z near x and y, if we change by some epsilon? Can use Ceres Jets to keep track of the differentiated values. Templatise the function so that you can pass in the Jet variables (instead of simply doubles). Then the return value automatically returns the derivatives as well as the function value! Consider cultural fit and technical fit – but if they do a separate cultural interview, 80% of people pass that anyway. Need to test communication and ability to write real code – asking knowledge questions only is not sufficient. Replace questions with practical exercises. std::string – easier and safer to work with than a c string. Handles memory allocation. Uses short string optimisation – short strings go on the stack, so no dynamic allocation. But – length of SSO buffer is implementation defined. If string is too long, will dynamically allocate. Also, the fixed buffer inside the std::string will frequently be much larger than a very small string you wish to create (typically 32-bytes). Don’t want to pay full cost of e.g. 32 byte std::string if your string will only be 3 characters. This allows you to specify the maximum length in the template. Get average 6x and 13x speed-ups for 8 and 32 character strings for both creation and access of string keys in maps. Can be more friendly for your cache and great for low-latency. Vittorio wants to write a generic log and call method with a noexcept handler – but has to type the same forwarding signature three times! Solution could be the “=>” operator that’s been proposed.